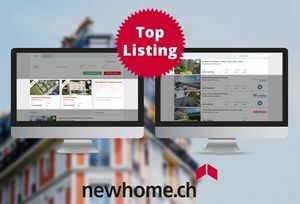 Take advantage of the Top Listing options of the Newhome.ch portal directly from our Immomig® software. In a few clicks, your online ad will receive more visits! Decide today for a "Top promotion" Listing and benefit from a click rate up to 4 times higher or opt for the "Special promotion" option and your ad will benefit from an even higher rate with up to 5 times more visits on your ad. By choosing one of these two Top Listing options, your real estate object will be displayed at the top of the results lists and will be highlighted in a special way which will increase its attractiveness. Indeed, your ad will be marked with a "Special" or "Top" label and its image will be enlarged. You will also receive once a week and by email detailed statistics about your publications. For any further information, do not hesitate to contact our team using the form below.